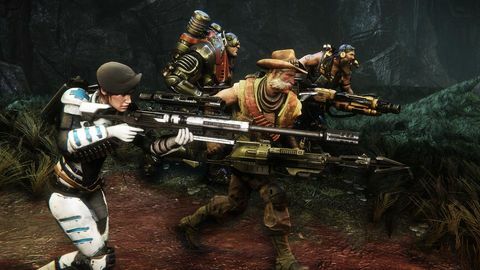 Turtle Rock has hit reset on Evolve, changing the game's business model in an effort to bring players back. Will this shift reinvigorate the beastly FPS? Chris monster-hunting once again. The buzz surrounding Evolve prior to its original launch was all but deafening. The 4v1 co-op giant monster hunt seemed to be doing everything right. Developer Turtle Rock had already proven its mettle with the Left 4 Dead franchise, and looked to repeat those previous successes with its epic ode to Kaiju. Critics loved the tense back and forth action and stunning visuals. All things pointed to greatness! Then publisher 2K released its DLC and microtransaction plans. Rightly or wrongly, the gaming public was not pleased – a triple-A game with a triple-A price then requiring ongoing additional purchases for content did not sit well with many. There were assurances from both developer and publisher that the player base would not be split as all new maps would be free, but new Monsters and Hunters – which are really at the core of the player experience – were paid items. The worm began to turn. Then came release day. Initially, Evolve did quite well. Critics enjoyed the experience, and it earned solid if not exceptional scores. However, once it was in the hands of the gaming public, cracks began to show. Slow match-making and unreliable servers affected not just the release window, but continued to be an issue long after, with occasional excruciating wait times and performance issues. Waiting really was the name of the game, as it became an almost unavoidable aspect of Evolve – even when in the “action”. That’s because hunting the monster was frustrating as often as it was exhilarating. Rather than being a cat and mouse game of escalating danger, it all-too-often became a laborious chore of hide and seek, culminating in a brutally short final clash between a fully-evolved ultra-predator and a woefully unprepared hunting team – a battle where only the most skilled teams had any chance of victory. Alternatively, with a highly skilled team, a less skilled monster player, or just a bit of luck, the match would end prematurely with a quick capture of an un-evolved monster, and its equally quick death. Neither of these outcomes were fun to play, and while there were plenty of games that fell between these extremes, all too often one of those unsatisfying scenarios would play out leaving a bad taste in everyone’s mouth. After only a few months, the game’s player base had dwindled to almost nothing. Steam’s own data had Evolve floating around 100 concurrent players in recent months. Surely that’s a death knell for any co-op or competitive game? That certainly was the case here. Evolve was dead. Long live Evolve Stage 2! Turtle Rock has resurrected its behemoth with a whole new attitude. The studio has redesigned almost every system, and rebalanced the core game in many subtle but important ways. The biggest single change, however, is not the game itself. 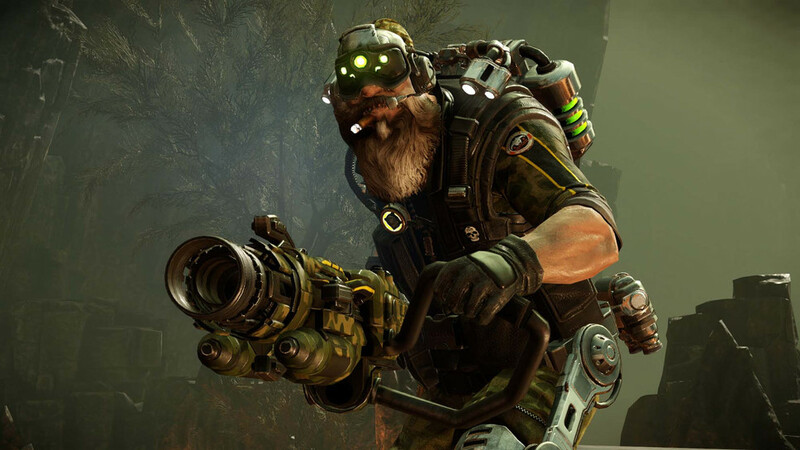 Evolve has embraced the new god of the online multiplayer game and gone free to play. In its current beta state, there is no option to buy anything with real money: all hunters, monsters, skins, and upgrades can be purchased using the new in-game currency – Silver Keys. These Keys can be earned by playing matches and completing daily challenges. There is likely some rebalancing yet to be done, but currently the rate at which you earn keys feels very generous, with unlocks becoming available at a steady rate. Most importantly, you feel like you are being rewarded for playing, and not just grinding. Turtle Rock has stated that premium purchases will be added in the future for those wishing to speed up the process, but the 100 percent free player is not only still competitive, they are also not segregated from those willing to doll out some cold hard cash, as all content can be earned in-game. The more skilled you are, the faster you will earn it, but nothing is gated behind a paywall. While the free to play model will likely bring in a lot of new players, the game needs to be able to keep them if it has any hope of survival. The main problem is that Evolve was frustrating as often as it was fun. The skill level required to enjoy the game was very high – even ؘat the very beginning. That’s not an ideal experience for a new player. Turtle Rock has acknowledged this, and a lot of effort has gone into reworking to core game to bring out Evolve’s most compelling features. The skill ceiling is just as high as before, but that barrier to entry has been dropped dramatically. All hunters and monsters have had their skills and stats rebalanced to make combat more competitive, and you should be seeing a lot more of that combat in Stage 2. The days of drawn-out tedious monster-go-seek matches looks to be a thing of the past. 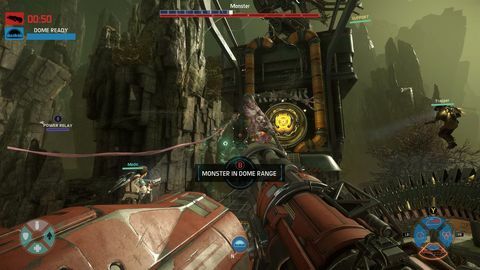 Most of the combat in Evolve happens in the mobile arena – a giant domed force-field that traps the monster with the hunters in a relatively confined space, forcing the fight. In Evolve vanilla, this was a specialist skill of the Trapper class and required manual aiming. A skilled Trapper therefore became essential, as without one, the monster was left free to roam, feed, evolve, and inevitably eviscerate your team. All too often, a team would be separated hunting for the monster, with no ability to confine it unless the Trapper was on hand. 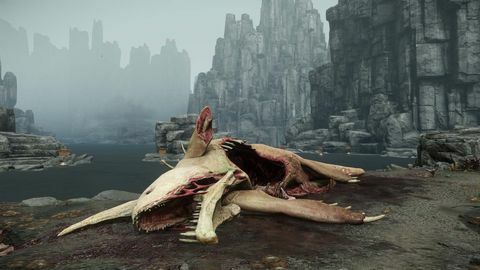 Another all-too-common scenario was when the Trapper would miss with the mobile arena, forcing another round of grind and go seek while the arena recharged. This thankfully has all changed! The mobile arena is now a shared skill, able to be trigged by any of the hunters. It no longer needs to be manually aimed: as long as it’s charged, you’re in range, and can see the monster, it will be captured every time. 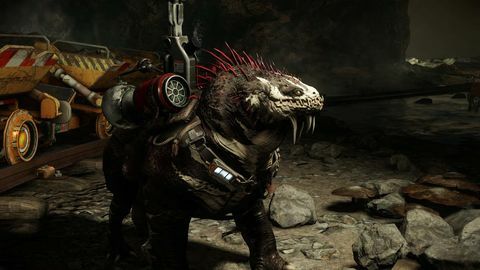 Combined with the Trapper’s new Planet Scanner skill which indicates the rough direction the monster is on every hunter’s compass, monster and hunter combat happens far more often. These epic battles are when Evolve is at its very best, and they’ve never felt better. The Arena can now be disabled if the monster does enough damage to the hunters relative to its power level. As a result, an early capture is no longer an almost certain death. With tweaked evolution point distribution and starting health, the monster is far more competitive in the early game, but not massively over-powered when full evolved. Teamwork is still vital from the hunters, but no longer will one player lead all to an almost certain defeat in the final stages of a match. The Assault, Medic and Support classes have all seen some attention as well, and all have had their skills updated to provide even greater team synergy. Even in its beta state, Evolve Stage 2 feels much better than its less-evolved original incarnation. The current four maps have been updated to help keep the hunt tense, the new UI is cleaner and clearer, and the upgrade and leveling systems have seen some much-needed streamlining. There also seems to have been improvements to the servers and match making, with games starting much faster than before. Its early days yet, but the PC-only beta is doing everything right at this point. (Console players will be able to get their hands on Stage 2 once the beta has been concluded.) Sadly, there does not seem to be a time frame for release at this point. However, for any PC gamers wanting to give it a try, there is no reason not to jump in immediately. The first update has already been released to improve the game and reward those that purchased it prior to its re-launch. With more hunters, monsters and maps promised, the future of Evolve Stage 2 looks very bright indeed. Long live the rEvolution! Turtle Rock hasn't just switched up Evolve's business models, it has drastically overhauled key areas of the game. If the beta is anything to go by, all the changes are for the better, and Evolve may finally grow into the game we all hoped it would be at launch.